THE most important thing is to get the Packing Nut loose. IF you cannot get it loose, there is no point in buying a new Packing Set. If the chrome on the rod is rusted, chipped, or pitted, there is no point in replacing the packing set. Getting the nut loose is either very easy, or impossible, in my experience. The nuts are usually cast steel, and shatter easily. THIS is what I have found to be the best way to hold the PA Ram securely to work on getting the nut loose. 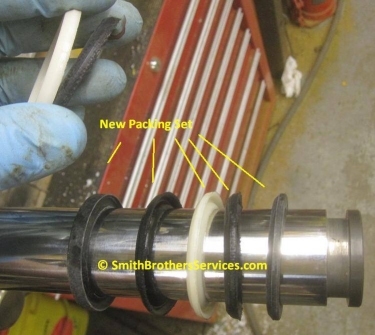 Loosen the Packing Nut all the way, and then yank out the Packing Set and Rod. I got this one loose and took the PA Ram apart a few months ago, so it is dusty. (Click on any picture on this page for a larger view). I separated the Packing Set to show the pieces. Take a picture of yours before you take the old ones off so you have a record of how many, and what order they are in. The new Packing Set will be installed the same as the old Packing Set. The new Packing Set comes with a new Wiper for the Packing Nut (sometimes called a Gland Nut) as well. Getting the old Wiper out and installing the new one can be a task. There is a special tool for installing them, and no, I do not have one. You can see in the picture that I do not have the Wiper fully seated on the one side. It has to be fully seated. New Packing Set installed on the Rod, you can see that I have two leftover pieces, which is fine. Packing Sets are for more than one PA Ram, you just use what you need from the set. The Packing Nut must be installed from the end of the Rod, so it is important to remove all the rust and paint. You will have a VERY hard time trying to put it on from the other end. 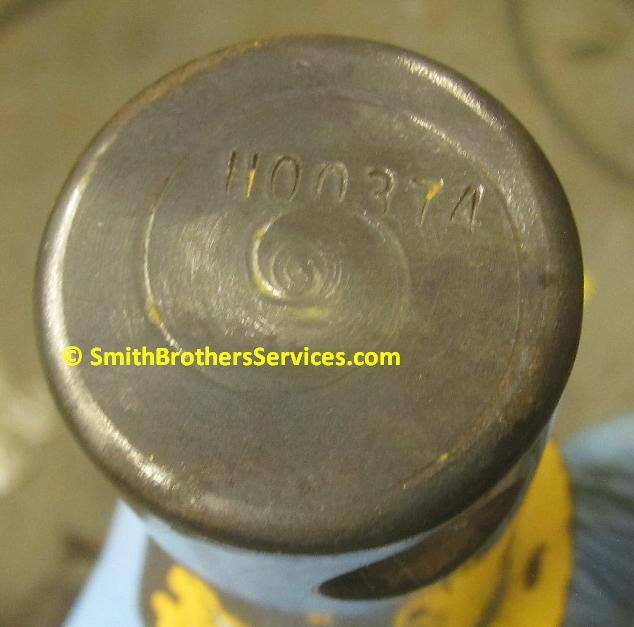 Some Rods have a numerical code, and others just have a date stamped on the end (useless info). 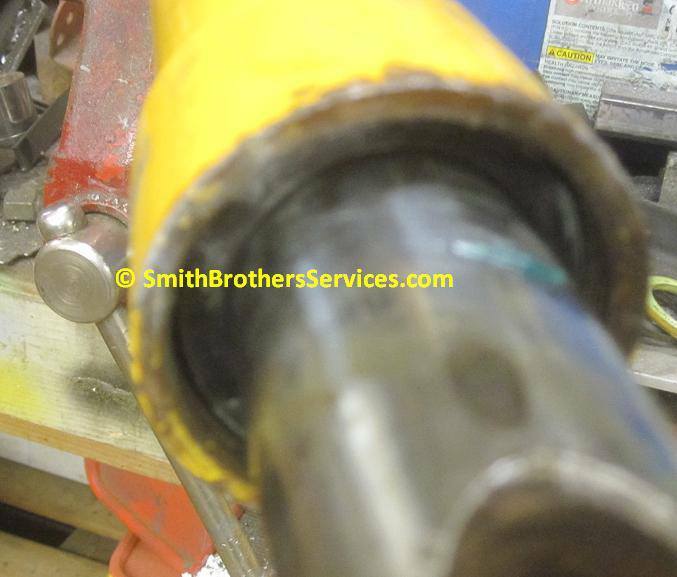 You can also see the end of the rod has a taper to make getting the Packing Nut on easier. 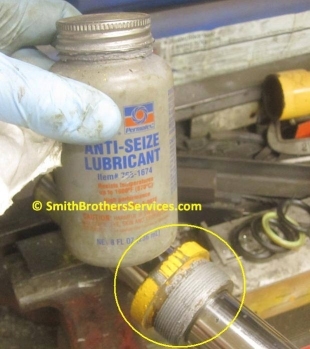 If you ever want to get the Packing Nut off again, use anti-seize on the threads. 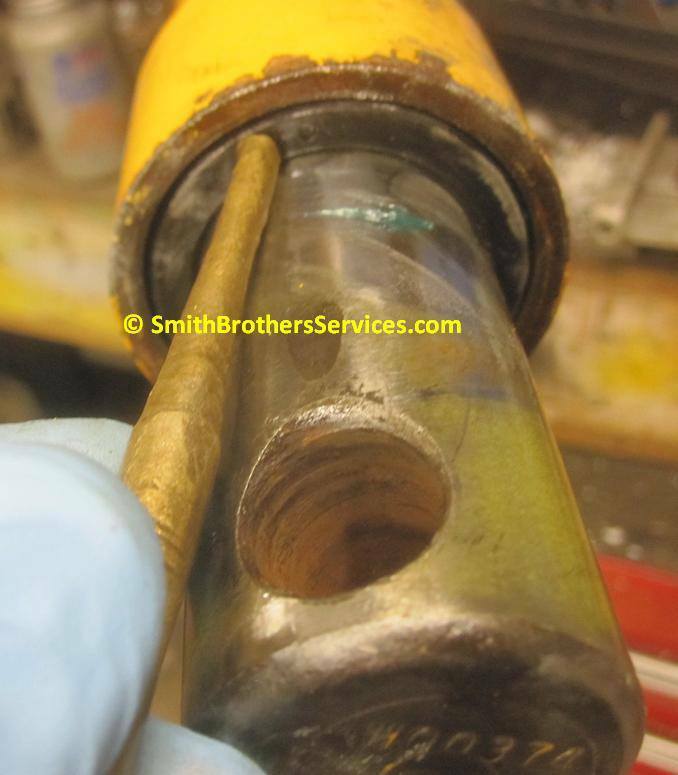 Coat the Rod and the Packing Set with hydraulic oil to make assembly easier. I am holding the split washer in place for the pic. To hold the split washer (two retainer Halves) in place for assembly, use a dab of grease on each half to hold it in place while you carefully get it back into the tube. Be gentle, wiggle it a little and it will go in. It can be frustrating, don't try to force it, you will just knock the Retainers off. GENTLE. 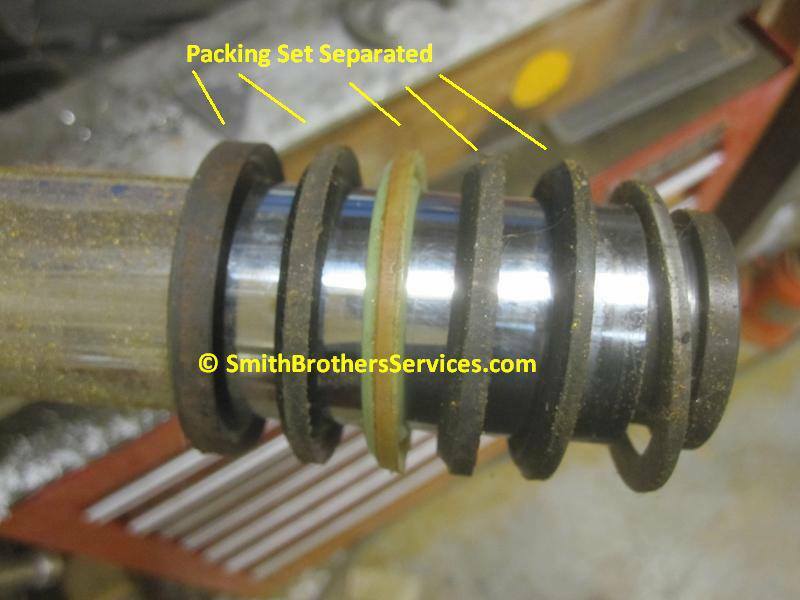 Work the Packing Set into the threaded part (that you coated in Hydraulic Oil as well) and then use a blunt drift to gently work the packing into the tube. Work your way around with gentle taps. You need to get it in far enough to use the Packing Nut to push it into place as you snug the Packing Nut. A little blurry, but you can see I got the Packing Set in about 3/8" which is enough to use the Packing Nut to seat the Packing Set. As you tighten the Packing Nut. 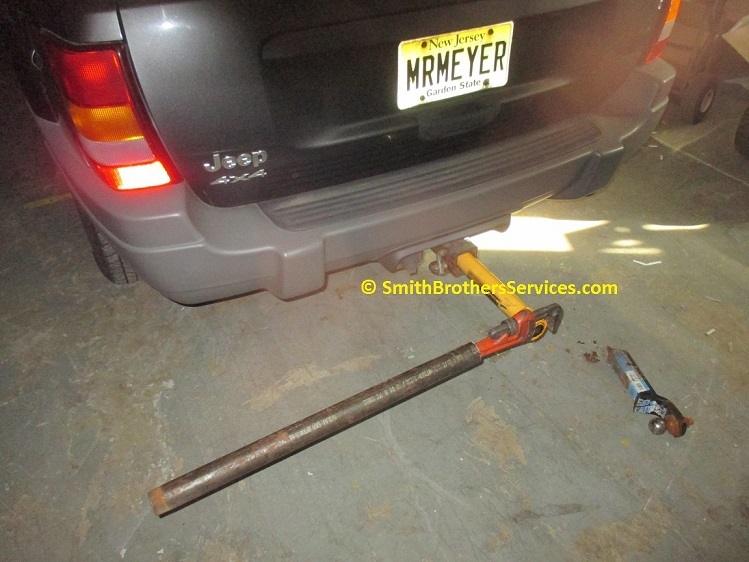 make sure you can spin the chrome Rod, and move it in and out, not necessarily easily, but that you can move it. If you over tighten the Packing Nut, you will lock the Rod in place. You generally snug the nut, then test the Ram. 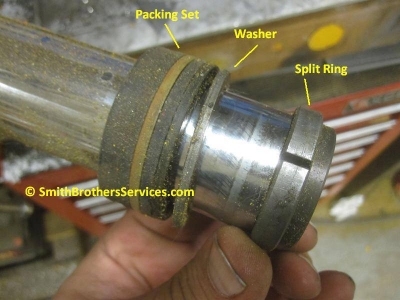 IF the packing leaks, snug the nut a little, and repeat until the leak stops. It so happens that the nut was tightened down completely. 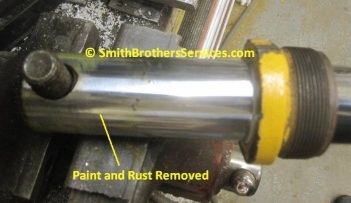 Often the Chrome Rod gets tight before the nut if fully tightened. That is fine. The nut does not have to be fully seated. 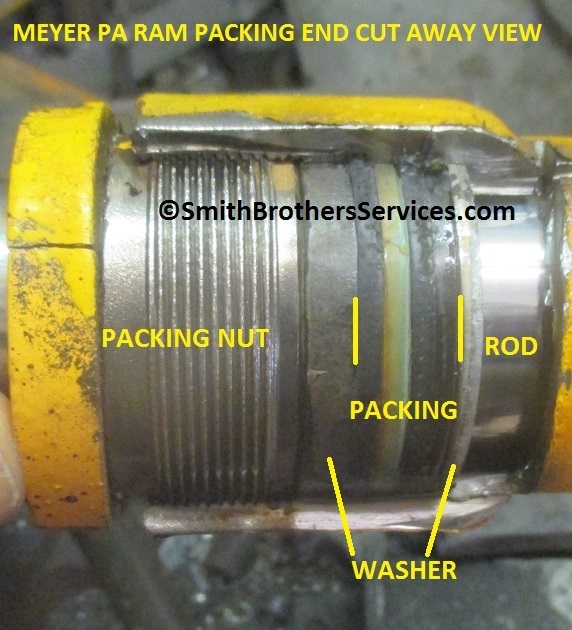 Take note of where the nut is with your old Packing Set, and you will see what I mean. That's it! A customer came in with this blown out PA Ram and bought a new one. So I got to play with this one. Why did it blow? 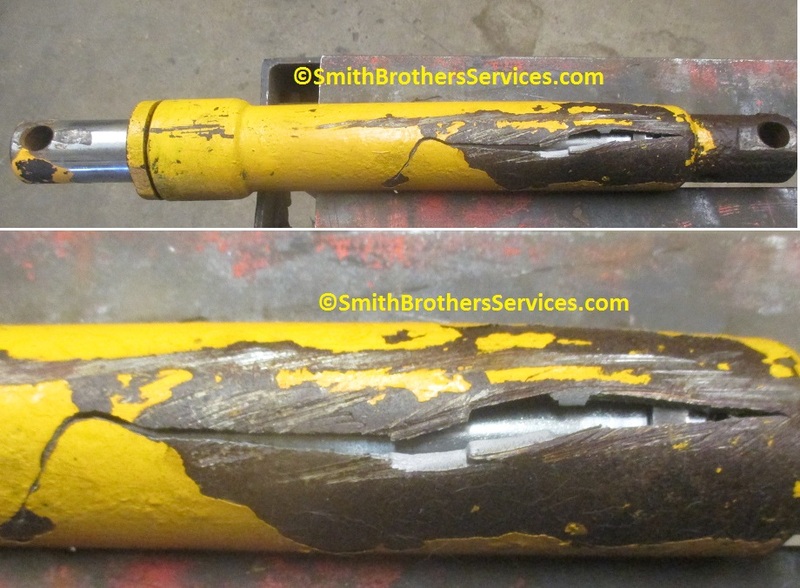 Well it blew out on the bottom side, and while it may be hard to believe, the deep scratches make it easier to blow out. Much like cutting glass, or cracking stone, once scored (scratched) it is easier to break along the score. So when the pressure spiked (for whatever reason) it blew. As I mentioned above, some of the Packing (Gland) Nuts are cast steel and they shatter when you try to remove them. This one did with almost no effort. When this happens, game over, buy a new PA Ram. I cut this open for a look inside. 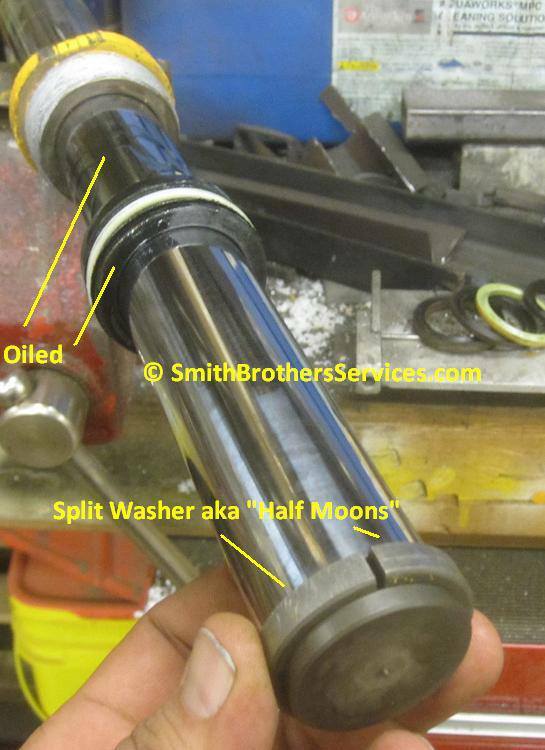 You can see the two retainer halves, sometimes they are a split washer looking part (Western used to have the split washer that looks like a huge lock washer). This is a very old PA Ram, all current Meyer PA Rams have nylon retianers instead of steel. This is because some of the recent designs put a tremendous side load on the Rod, and the steel was scraping on the inside, wearing away the cylinder wall. IF your PA Ram has SAE threads, it has nylon. We will get back to this later on this page. Another angle, looking inside the Meyer PA Ram. You can see the port in the end. I cut a piece out of the Packing Nut, to show you the Packing seated once assembled. Getting back to the Nylon retainer. IF for whatever reason, the PA Ram tries to hyperextend, unlike the older design, the Nylon will get hammered against the steel Packing Nut. When this happens, the Nylon will disintegrate and put little pieces of what looks like white rice into the system. It can plug hoses solid, and stop the plow from angling. 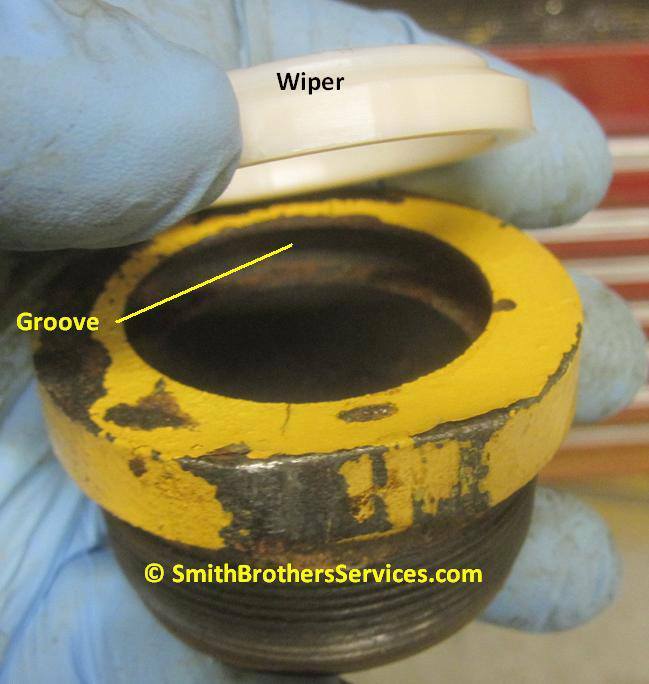 On the E-72 you may find pieces in the Dual Pilot Operated Check Cartridge on the front of the unit. The plow may not hold angle. 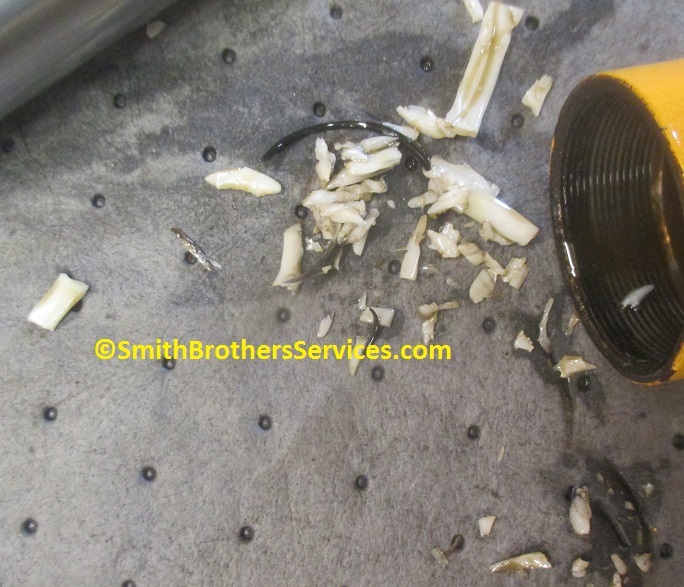 IF you find even ONE piece of "rice" you need to remove BOTH PA Rams, disassemble, and get all the pieces out. You can replace the Nylon with steel retainers without any problems, BUT you have to idenitfy WHY the PA Ram was hyperextending, or at least prevent it from happening. You don't want the PA Ram stroke to be the limiting factor in angling the plow. There are angle stops for a reason. After you remove the PA Rams, and get all the pieces out, and replace the Nylon with steel, when you go to install the PA Ram, put the bolt through the back hole first, and fully angle the plow by hand the opposite way. IF the bolt hole will not line up for the front PA Ram bolt to go in, you need to weld an additional stop to the angle stop, thick enough for the PA Ram to not go full stroke, leave a 1/2" or so for play in the bolt holes that will develop over time if not already. One other note, there is no Packing Set on the PA Rams with SAE threaded ports. There are O rings in the Packing Nut only. You still want to use anti-seize on the threads, but the difference is that the Packing Nut DOES get tightened down ALL the way. You can see with all the chewed up pieces of Nylon, there is also a piece of O Ring. 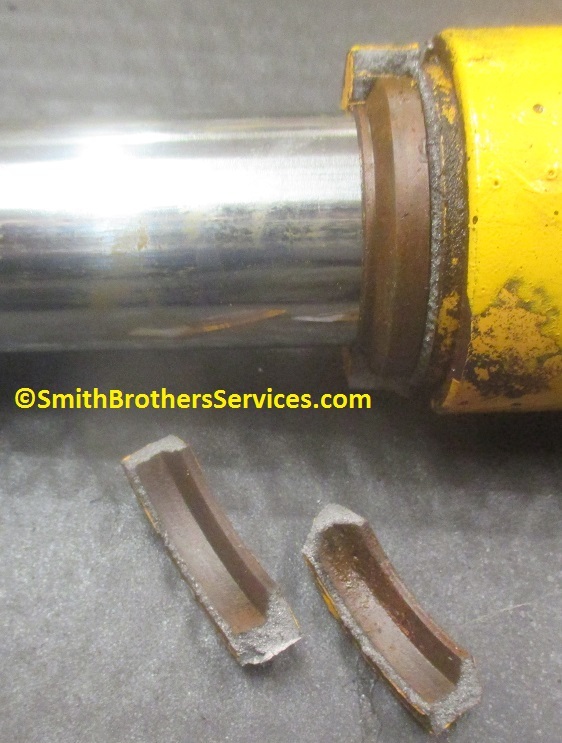 When this PA Ram hyperextended, the Rod was able to move to one side, which damaged the Packing Nut and took a chunk out of one of the O Rings. 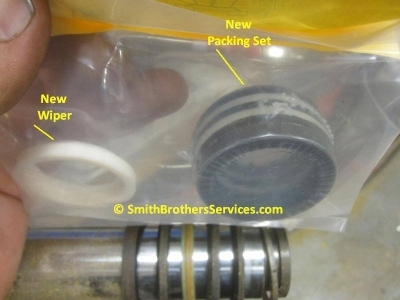 The Seal Kit (15964) for the SAE PA Rams is only available from Meyer, and it has a List Price of $58.36. There are two things to keep in mind. 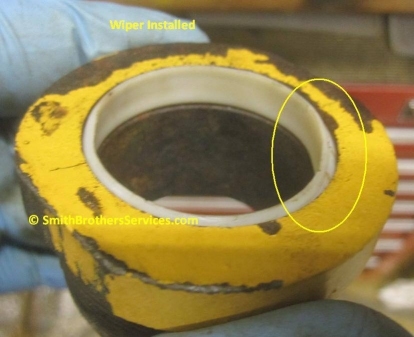 First, the cost of the Seal Kit, and the cost of labor to have it installed, can easily pay for a new aftermarket PA Ram that does NOT have Nylon in it. Like above with the old style PA Rams, IF you can't get the Packing Nut loose, you are buying a new PA Ram anyway. In my experience, the aftermarket PA ram is just a little longer than OEM Meyer, so you may not have to weld on additional stops to limit the stroke of the PA Ram. 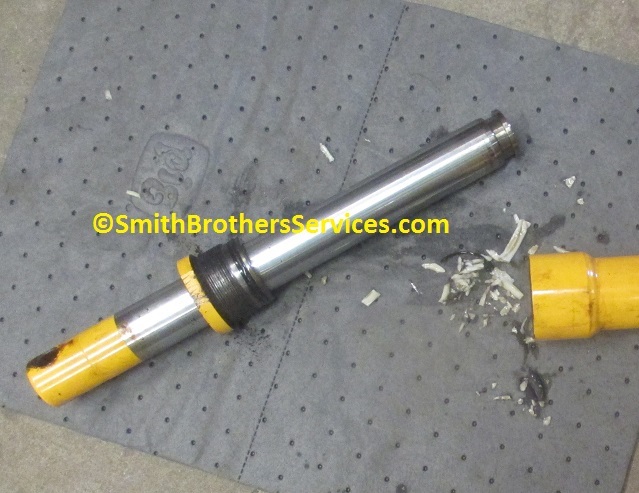 Packing set for Meyer 1.5" diameter Angle Rams, both 10" and 12' long. One set is required for each ram. Aftermarket power angle ram for Meyer ST and TM Series plows. 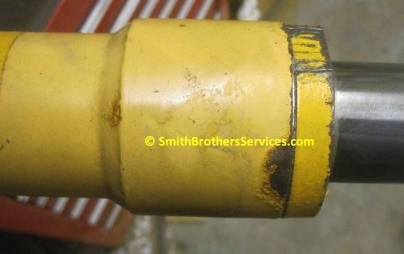 Measures 10" from weld to weld on cylinder. Also fits some C Series plows. Port is 1/4" pipe thread and exits on top of ram. Aftermarket power angle ram for older Meyer C Series plows. Measures 12" (approx.) 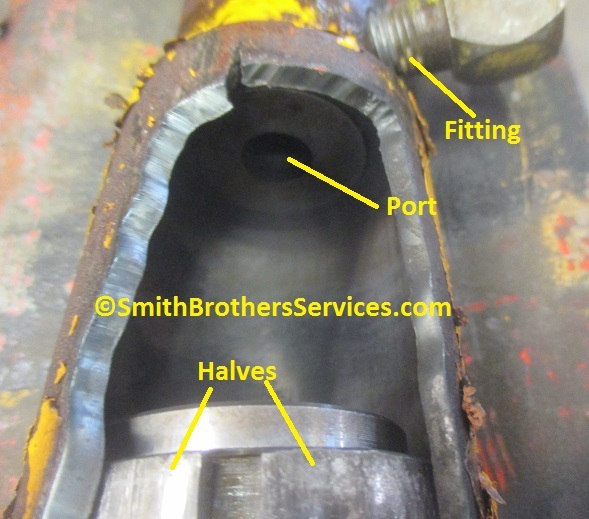 from weld to weld on cylinder. Port is 1/4" pipe thread and exits on top of the ram. Common Misspellings: Meyers, Mayer, Mayers, Myer, Myers, Maier, Maiers, Meijer. Keywords / phrases: plow angle arms, meyer plow angle pistons, plow angle cylinders, plastic bits in power angle cylinders, white plastic in meyer angle arms, white plastic bits in plow angle rams.